WELCOME TO THE BACK PORCH GRILL! 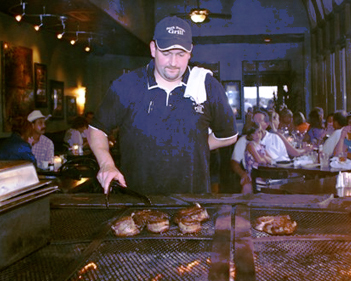 Founded in 2002, the Back Porch Grill is a family-owned and family-friendly favorite for locals and visitors alike in Hot Springs, Arkansas. Our prime location on beautiful Lake Hamilton invites boaters and walk-ins alike to enjoy our relaxing sun-splashed outdoor patio, warm interior decor and great food. The Back Porch Grill prides itself on using only Black Angus beef for our legendary hand-cut steaks, but that's only the beginning — we also serve a delicious variety of seafood, pastas, salads and signature appetizers. Click here for menu. LOOKING FOR A GREAT LOCATION FOR YOUR PRIVATE OR CATERED EVENT? Back Porch Grill can help you with both (more info here). How about some great cocktails in a 21+ lounge atmosphere? Just head upstairs to Martini's On The Bay for your favorite libation before or after your meal. We offer free parking plus valet parking on weekends; We accept cash and all major credit cards. Call today or email us for more information - see for yourself why the Back Porch Grill is "As Good As It Gets."